Corporate defaults have closely reflected economic conditions, with high year-on-year increases seen in 2012 and 2013. This was mainly a consequence of the drop in internal demand and generally high pressure on businesses’ liquidity because of limited options for external financing. 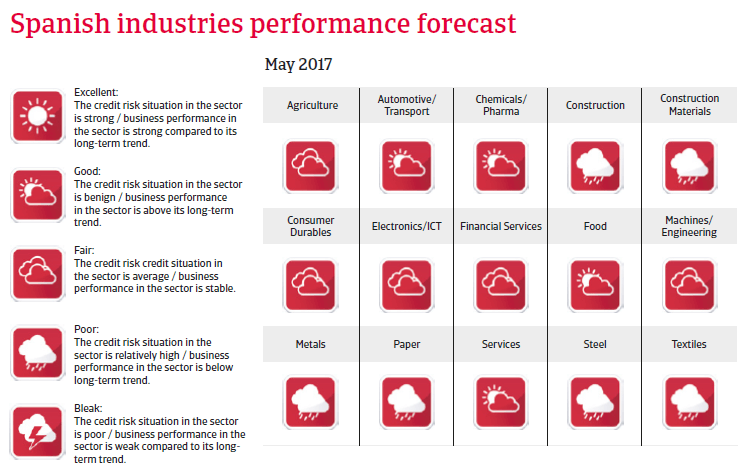 However, with the economic rebound since 2014 insolvencies began falling again, and this positive trend is expected to continue, with business failures forecast to decrease 8% in 2017. 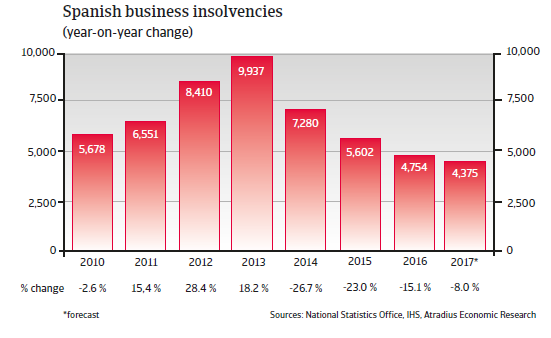 This would still leave business insolvencies at a high level of about 4,400 cases, not yet fully recovered from the increases since 2008, when about 3,000 cases were recorded. Spain’s economic rebound gained further momentum in 2016, with GDP increasing again by more than 3%. 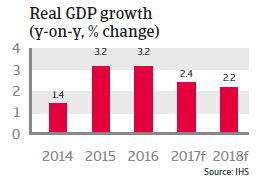 In 2017 economic growth of 2.4% is expected as household consumption remains robust (although the positive effect of lower energy prices, fiscal stimulus and income tax changes seen in 2016 fade), and unemployment continues to decrease. 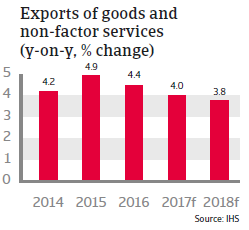 Both real fixed investment and industrial production are expected to continue to grow and export growth to remain robust in 2017. After three years of deflationary consumer prices, inflation is expected to return. The deleveraging of household and corporate debt continued in 2016, but there is still some way to go, as both debt levels are still above eurozone averages. The resilience of Spanish banks has improved further in 2016, in terms of asset quality and capital. However, the level of non-performing loans remained high compared to that of other EU-members. With one exception, Spanish banks have passed the 2016 stress test of the European Banking Authority. 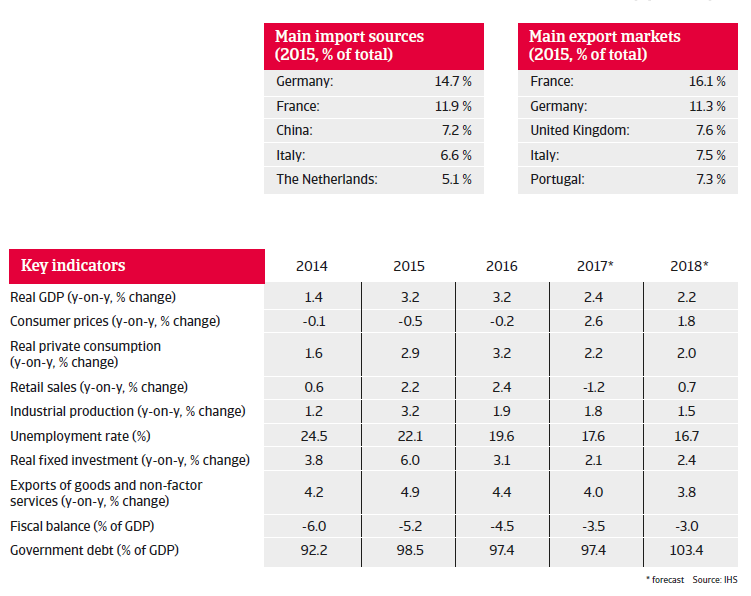 In July 2016 the European Commission conceded Spain two additional years, until 2018, to lower the budget deficit to less than 3%. In 2016 a fiscal deficit of 3.5% of GDP is predicted, followed by a reduction to 3.0% of GDP in 2018.